Magikarp Jump was definitely not the game I was expecting. I'd pictured something a bit more action/platformer-y, and instead got... I guess you could call it sort of a hands-off virtual pet? Though it's not without its charms. There isn't a whole lot to do, but there are ways to speed up your progress. Eat everything, all the time. Food is nothing more than free XP, so your Magikarp won't ever get full (or starve). So while not eating won't hurt, it's always beneficial to stuff your Magikarp with food at every opportunity. Always tap on other pokemon. From time to time you'll see other pokemon swimming around the enclosure. Tapping on them will give you all sorts of goodies, from more coins to piles of food. Decorate your Magikarp's enclosure. You can spend the diamonds (premium currency) you earn via events or completing achievements on fixtures for your enclosure that will grant your Magikarp passive bonuses - like earning more experience from food or getting more money from league battles - for as long as they're in place. Look out for pokeballs. If you see a pokeball floating around, tap to open it and earn some extra coins. Keep training. You get a few training points at a time, which will be restored over time. Use them all up every chance you get in order to get bigger experience boosts. Keep checking the Town menu. This is where you can spend coins to unlock new food and training techniques, as well as upgrade them to yield more experience. Try to beef up your basic food and training first. The stuff you unlock ends up being much better in the long run, but food appearances and training selection is random so there are to guarantees you'll get the more advances stuff. By boosting the lower-end food and training you ensure that your Magikarp always gets a worthwhile amount of experience points. When a Magikarp reaches its maximum level you'll have no choice but to compete in the league until you either beat the champion or lose a match. Once that's done, your Magikarp will retire and you'll have to catch a new one. Retirement is fine. 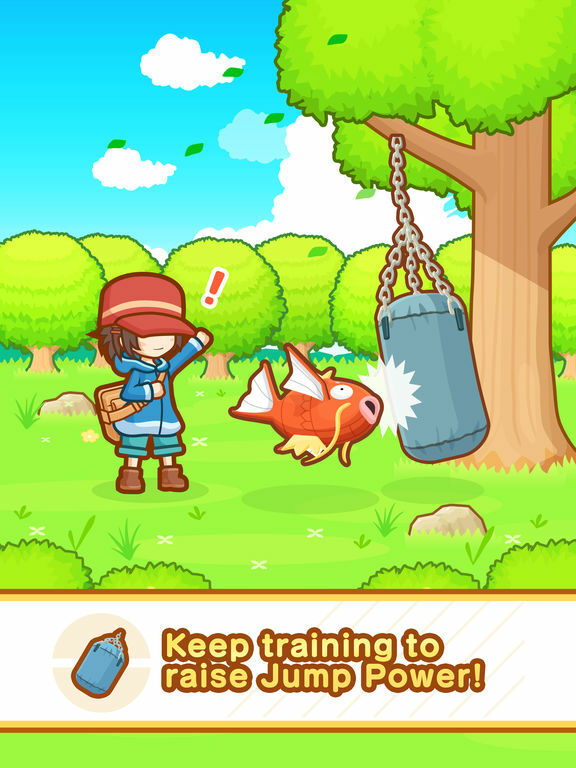 As you progress in the league your training rank will increase, which allows you to train Magikarp to higher and higher levels. In addition, if a Magikarp retires without finishing a league you have to start the league over. This is a good thing! Rematches with old opponents still earn you trainer xp as well as coins. Charm is about all Magikarp Jump has going for it, honestly. It's cute and silly and harmless, but it's also devoid of anything you could consider 'gameplay.' This is fine if you know what to expect and don't mind a simple, menu-driven distraction with the occasional adorable cartoon thrown into the mix, but if you're looking for a more game-like game you'll likely be disappointed. There's just something about Magikarp, isn't there? It's one of the most useless pokemon but it also ends up being quite powerful if you put the effort in. I find hard not to love the stupid fish for that - or for its tenacity. So why not make a game that celebrates the giant not-goldfish? 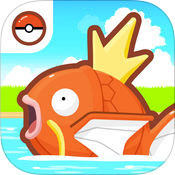 Well, Magikarp Jump does sort of give Magikarp its day, but it also pokes fun of the pokemon (in a lighthearted way) and, really, there's not a whole lot to it. Yet here I am still playing it for some weird reason. Turns out I was wrong in my perception of Magikarp this whole time. They don't just 'splash,' take up a slot on the team, and evolve into Gurados - they also jump. They jump really freaking high, actually. So of course there's an out of the way rural town that nobody's ever talked about before that's full of Magikarp lovers. And of course said previously unheard of town has its own league devoted to Magikarp jumping competitions. The world of Pokemon is really freaking weird if you stop and think about it. Your Magikarp just sort of swims around its enclosure doing nothing until you decide to interact with it. You can technically feed it, but food is purely a means of increasing experience rather than as sustenance. It doesn't need to sleep, it doesn't need to play, and you don't have to clean up after it. All you really do is tap on food to make it eat (i.e. collect experience points), fiddle with the enclosure, maybe spend some money one a few upgrades, and train by watching a short animation as a few numbers go up. I do have to admit that the idea of jumping contests with some of the most useless pokemon has an absurd sort of charm to it - much like the pokemon itself, really. I also think the slow but steady pace at which new things like higher point value food or more advanced training techniques unlock provides a decent reason to keep playing. It's all functionally the same - you just get more points from newer stuff - but it's still something to shoot for. The big problem with Magikarp Jump is that there's nothing to really do. I mean mechanically. As I've mentioned previously, most of the game is just selecting stuff out of a menu. Even the jump competitions themselves are devoid of player action. You get to watch, hoping (usually knowing well beforehand because of your Magikarp's overall level) your fish jumps higher, then the distances are revealed and you go back to selecting stuff out of a menu. Tapping food to make the Magikarp eat is about the only real game-like actions you get to take. 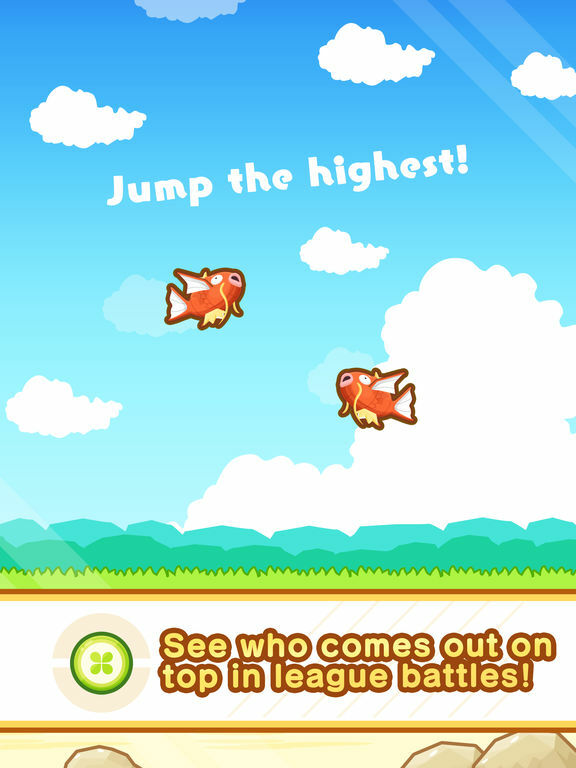 Despite the lack of any real gameplay (even by 'clicker' standards), Magikarp Jump is still an okay distraction. Sure you're not really doing anything, but it's difficult to hate on such a goofy and charming premise. That, plus it's the sort of thing that's perfect for killing a few minutes here and there when waiting in line or otherwise just looking to pass a bit of time. Just don't expect any conventional forms of fun and you should be fine.